To be interested solely in technique would be a very superficial thing to me. If I have an emotion, before I die, that’s deeper than any emotion that I’ve ever had, then I will paint a more powerful picture that will have nothing to do with just technique, but will go beyond it. Unfortunately, this day chewed a big chunk out of me, time-wise. Summer school needed more attention than usual, my washing machine broke down and I had to wait for a repairman, and there was much end-of-the-month household maintenance to address. All told, I did not even get to touch this watercolor until 5:00 this evening, when there was very little left of me. 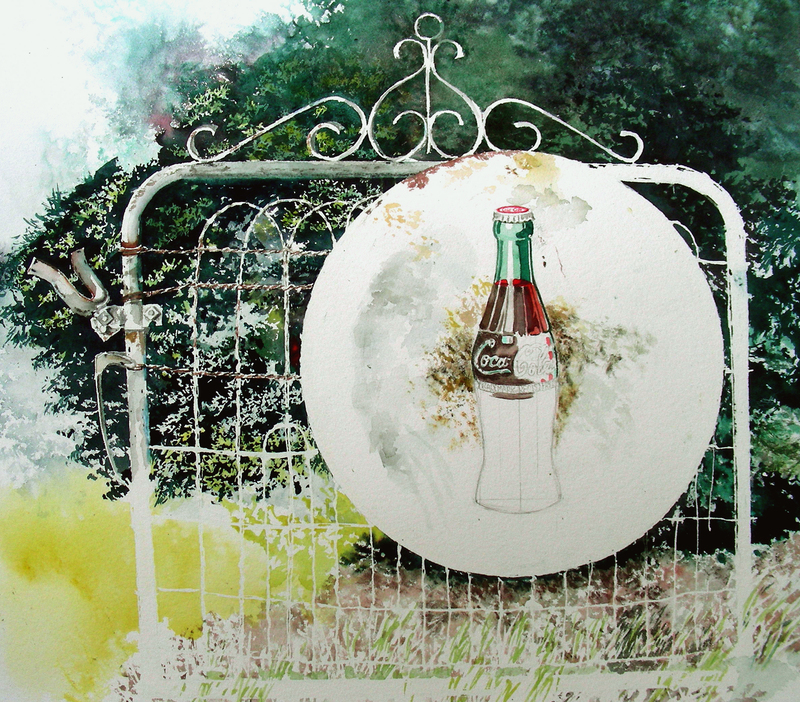 Nevertheless, I have been eager for days to address the details on the metal gate that supports my Coca-Cola sign, I was delighted to acquire this last month, have gazed upon it daily (the only thing it’s missing from my childhood is honeysuckle poking through the wires), remembering childhood days at grandparents’ farms. These gates used to be everywhere. Now they show up in antique stores and resale shops. 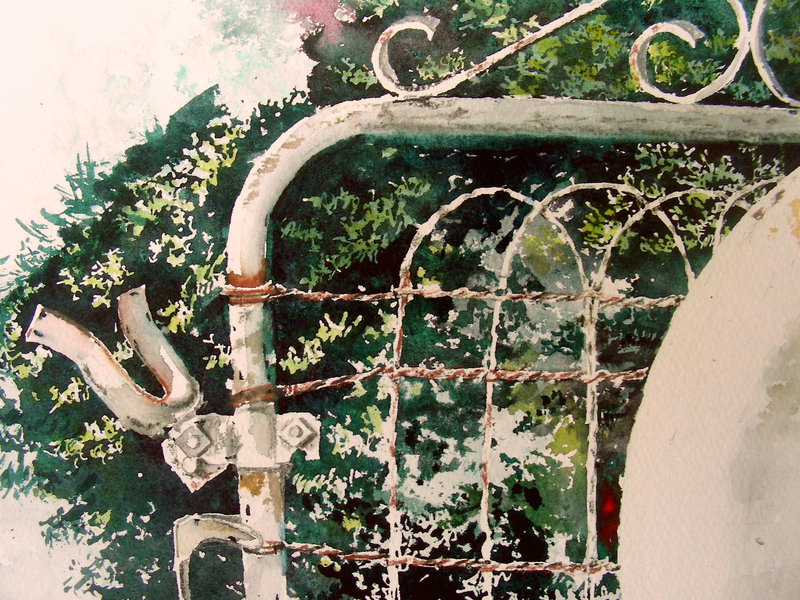 In a sentiment matching the statement posted above by Andrew Wyeth, I gladly worked on the gate late this afternoon, giving little thought to technique, and just reaching for anything that could help me achieve my objective. I found pleasure, working with graphite, watercolor, my fingertips, Q-tips, and colored pencils. The snow falls on no two trees alike, but the forms it assumes are as various as those of the twigs and leaves by the genius of the tree. So one divine spirit descends alike on all, but bears a peculiar fruit in each. The divinity subsides on all men, as the snowflakes settle on the fields and ledges and takes the form of the various clefts and surfaces on which it lodges. 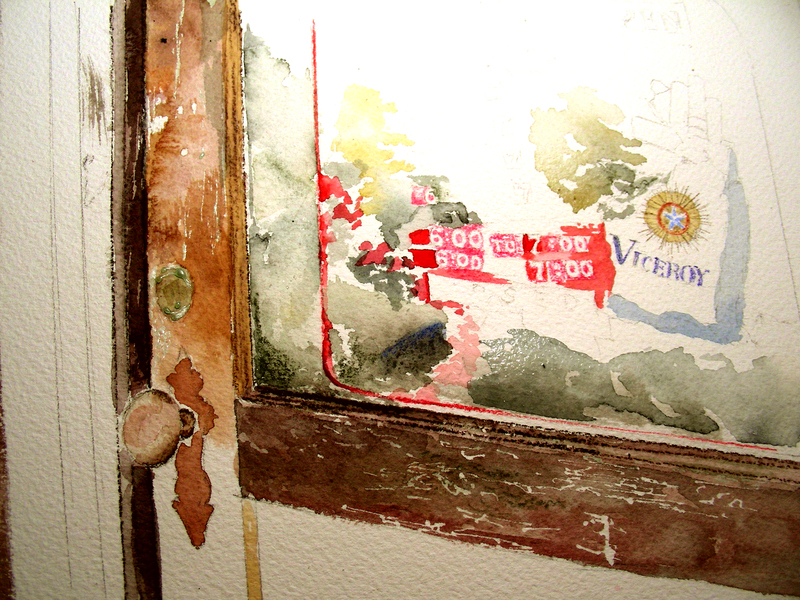 I finally laid down the watercolor brush as the sun faded from my studio windows. I have refused to work under house lights on this watercolor, and really hated to lose the natural light. I felt that I still had so much energy and enthusiasm left in me to proceed. I only hope that the appetite is still there when school ends tomorrow. Relaxing over the Journal of Henry Thoreau, I was suddenly gripped by this text I’ve just posted. As a high school teacher, I have tried for years to encourage my students to find their own voice, to seek their own path. But what a powerful metaphor Thoreau uses here! It certainly got my imagination going, the notion of inspiration couched differently in individuals. Throughout my years as educator and artist, I have tried to avoid those cookie-cutter templates that hold the attention of public education and taste. Those who know my work are aware of my deep admiration for the watercolor technique of Andrew Wyeth. Yet I knew years ago that I did not want to set a course to “ape” Andrew Wyeth. As a student of art history, I have always wanted to emulate particular features from a number of artistic heroes, rather than “channel” one. I have always wanted to assemble techniques into some kind of a toolbox, and in the process, hope that some kind of “style” might eventually emerge that I could call my own, my own voice. On the last blog I wrote about drybrush and my attempts to weave it over watercolor wash, hoping to find some kind of “musical” composition in the combination. Today I want to address color. In my years of studying Andrew Wyeth, I always wondered why his neutrals seemed more “lifelike” than mine. Once I threw away my sepia, burnt umber, paynes gray, burnt sienna, etc., I found myself moving closer to what I wanted. My palette has been very restricted over the past few years, working almost exclusively with primary colors. This vintage sign from which I’m working measures 36″ across. I’m getting lost in it, as I sit just a mere five feet from it in my studio, with the northern lights bathing it all every afternoon. I’ve been mixing the brown pigments in the Coca-Cola bottle from a combination of Winsor Blue (Red Shade), Transparent Yellow and Winsor Red. Three years ago, I would have been using sepia, burnt umber, raw umber, or something of that nature. I’m fascinated to see these three colors meshing and watching the gradations occur as I add water. 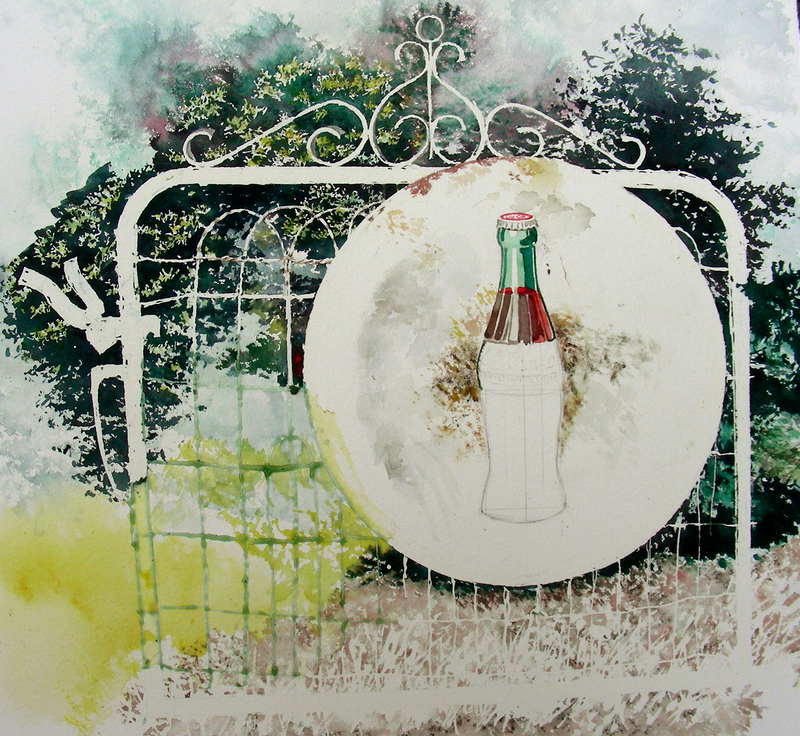 Staring at the sign, I’m fascinated with the imagination of whomever painted this Coca-Cola bottle. 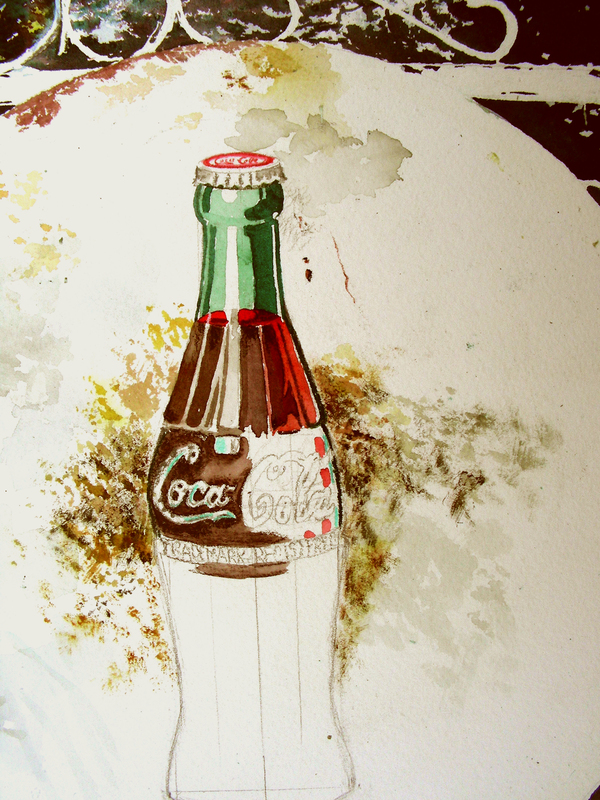 The right-hand side of the bottle neck is outlined in dark green, with an aqua pin-stripe on the inside, before transitioning into that warm brown “cola” color. The highlighed facets of the bottle are warm gray, and there are plenty of pools of bright red flanking the cola-brown. As I continue to explore the surface, I’m intrigued by all these aqua highlights that occur across the surface. I’m also trying to solve the myriad of tones appearing in the abused part of the white surface of the sign. It’s been hit with a shotgun blast, and there is much corrosion as well. There are so many different values mingled among all that damage. 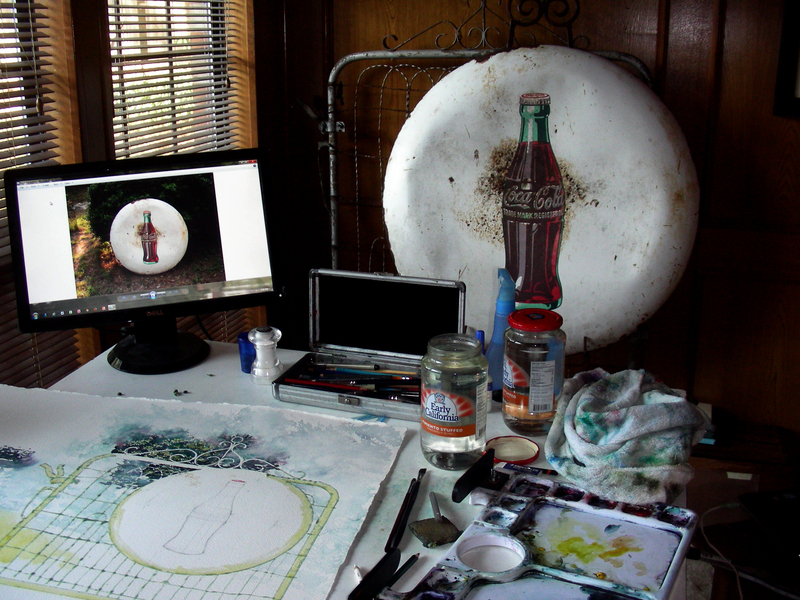 The drybrush and scrubbing of the surface here is presenting a different kind of a challenge than the myriad of details covering the bottle image itself. The longer I play with my palette, experimenting with the color mixing, the more I feel like a mad scientist in his laboratory. It all adds to the fun and intrigue of the studio. I work in drybrush when my emotion gets deep enough into a subject. . . . It’s a weaving process–one applies layers of drybrush over and within the broad washes of watercolor. And I sometimes throw in pencil and Higgins ink. Finally today I have gotten down into the business of drybrush, texturing the vintage Coca-Cola sign, and working on the ground textures beneath where the grass will lie. The afternoon has been an exquisite one–the northern lights have flooded my studio, and Andrew Wyeth’s words have washed over my psyche like an oracle. As I poked the drybrush and pencil over the washes I had laid down, spritzed the area with the spray bottle, and applied salt, I came to the realization that I am not haphazardly throwing media on the paper, as it may appear to anyone watching. After years of experimenting with drybrush and pencil in watercolor, I’m finally settling into some known patterns, but still taking risks, all the time noting what works and what doesn’t. At this juncture in my iife, I am also trying to learn electric guitar, practicing scales and playing lead patterns over backing tracks. What an amazing similarity. Of course I note that my electric lead is about as attractive now as my watercolor drybrush attempts were ten years ago. I am missing much more than I am hitting, but at least not despairing! It dawned on me this afternoon that lead guitar players successfully weave music over the backing rhythm sections by applying patterns already learned that work, while at the same time risking new ventures, and creating new tunes. As a painter, I am much further down the road, meshing drybrush with a backing wash. Perhaps with practice and patience, I will someday play lead guitar, successfully meshing single-string tunes with a rhythm section. In the meantime, it is refreshing to think on this connection between guitar playing and watercoloring. I think the painting is dry enough to return to now, so I’m going to get back to the drybrush. Of all strange and unaccountable things this journalizing is the strangest. It will allow nothing to be predicated of it; its good is not good, nor its bad bad. If I make a huge effort to expose my innermost and richest wares to light, my counter seems cluttered with the meanest homemade stuffs; but after months and years I may discover the wealth of India, and whatever rarity is brought overland from Cathay, in that confused heap, and what perhaps seemed a festoon of dried apple or pumpkin will prove a string of Brazilian diamonds, or pearls from Coromandel. Though I stayed up late last night, I was awake by 9:00 this morning. After putting on coffee, I sat in the morning light reading from the Journal of Henry Thoreau. I found this quote amusing as well as insightful. I began my journal activity in 1986. I haven’t counted the volumes recently, but know that they exceed 110 by now. I’ve had some good years, some good entries, some insightful recordings. And I have also produced pages of stuff worthy for kindling in the fireplace. I suppose if I had never kept a journal, I would not have easy access to my thoughts over the past couple of decades, notes jotted down from books and magazines, original constructions that were used as skeletons for high school and univeristy lectures as well as public speeches and sermons. And I probably would never have launched a blog had I not followed the journal instinct throughout my professional life. The more I read Thoreau, the more convinced I am that he is a kindred spirit. I’m so grateful to have been introduced to him. 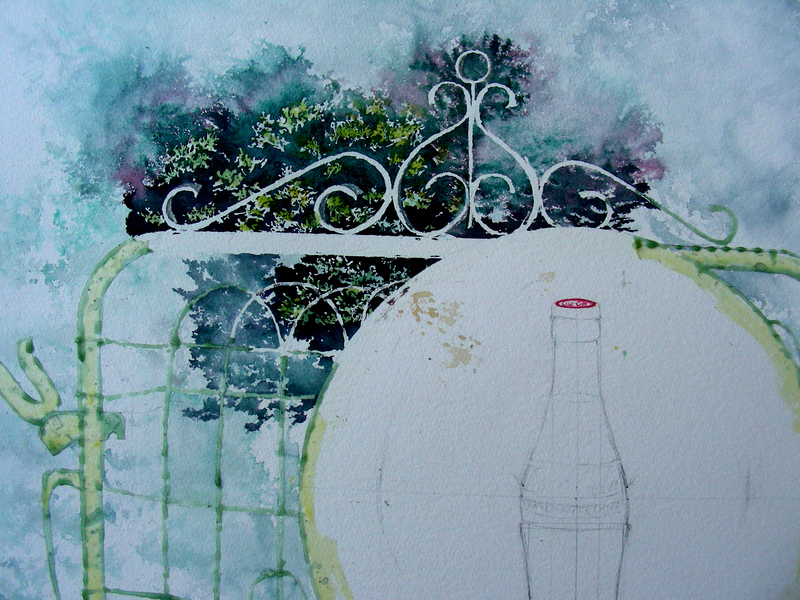 As for day two of my watercolor, I worked through the morning, masquing, rendering more foliage, and detailing the twisted gate wires and a small portion of the Coca-Cola sign. The painting is large–22 x 28″–and I am enjoying it challenges. I cannot wait to take it up again after school tomorrow. I don’t play with Crazy Horse all the time. You can’t wear it out. You know, it’s like you can’t constantly be doing everything. You have to give it a rest. It’s like planting stuff. You’ve got to let the field rest for a year. I did not intend to get away from watercoloring. Several things entered my life the past couple of weeks. Summer school got busier (my class has grown by one-third this second semester, accompanied by a chronic absenteeism that wasn’t happening the first term). I also picked up my guitar again and played in a live gig that required some rehearsals. Then an unforseen series of events led to my standing in my waders, waist-deep in Windmill Lake at the LBJ Grasslands, flyfishing for largemouth bass. It had been too long since I last enjoyed that avocation, and I was very grateful for the experience. I also have become friends with a remarkable guitarist, Reid Rogers (http://reidrocks.com) who has me doing things with an electric guitar that I have never before accomplished. Reading has also chewed into my lifestyle. I took off three days to read Dan Brown’s Inferno, which then led me to Dante’s Divine Comedy. I’m also reading The Andy Warhol Diaries. And my mornings still begin with the Journals of Henry David Thoreau over a cup of coffee. Texas temperatures are dreadful in the summer, so my garage Man Cave has been abandoned till probably October. I brought my favorite vintage Coca-Cola sign into the house from the Cave, and set it up on an easel next to my northern light windows. Behind it I positioned this gate that was a Father’s Day gift from a lovely friend. The previous owner of the vintage sign sent me a photograph of it fronting an evergreen tree, so I am looking at that image on a computer and trying to paint it into the backdrop. This watercolor is on a full sheet (22 x 28″) of 300-lb. D’Arches cold-press paper. I usually don’t quake over a $20 sheet of paper, but since I hadn’t painted this large in over six months, and hadn’t painted at all since my last 8 x 10″ over a week ago, I felt somewhat timid as I approached this one early this morning. Lacking the technical tools, I used a frying pan to draw the circle of the sign. 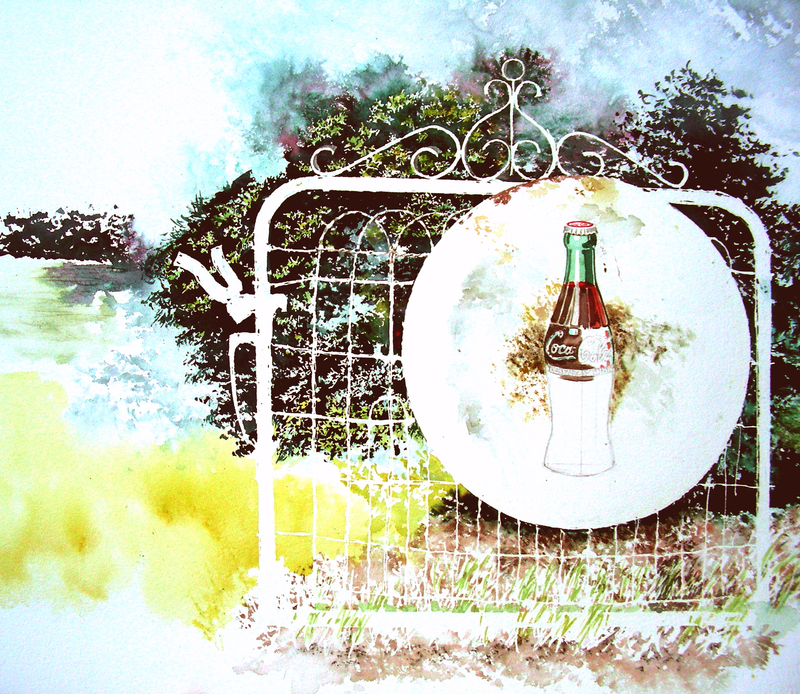 I had to re-draw the gate several times, fitting the sign to its dimensions in a satisfactory way to suit the composition. Next came the odious task of all that masquing–so many bent, twisted wires, steel framework and scrollwork on the top. Though I have been at this since 7:15 this morning (it’s 8:21 p.m. as I write this), I have never worked on it for more than forty-five minutes a session. As I wrote earlier, I’m a little gun-shy since I hadn’t painted on this large of a scale for awhile. I kept backing off from it and re-checking the proportions of the composition. Like the carpenter who cuts once, measures twice, I kept erasing and redrawing the Coca-Cola bottle on the sign. Since high school, I have found the drawing of bottles extremely difficult. I constantly measured and put this bottle on a grid, to make sure the proportions lined up, and kept double-checking the symmetry of the opposing sides. But I enjoyed every moment, truly. During my breaks, I continued to read from Dante, Thoreau and Warhol. And of course, I’m always scribbling in my own journal. Once the masquing dried, I mixed a cool highlight for the leaves of the evergreen and began by spritzing the paper with a spray bottle and floating the light bluish-green pigments all over the gate. Once it was dry, I used the Fine Line Resist Pen to draw the highlighted leaves. Once that dried, I mixed a concoction of Winsor Green, Winsor Violet, Alizarin Crimson, Transparent Yellow, WInsor Blue (Green Shade) and Permanent Rose to make as-near-a-black as I could for the shadows in the tree. I applied this liberally over all the tree, then sprinkled salt in it and used the spray bottle to break it up. After all that dried (plenty of time to read today!) I came back and removed all the masquing, applied Transparent Yellow to some of the highlighed leaves, then rendered some of the twisted wire and metal gate framework. 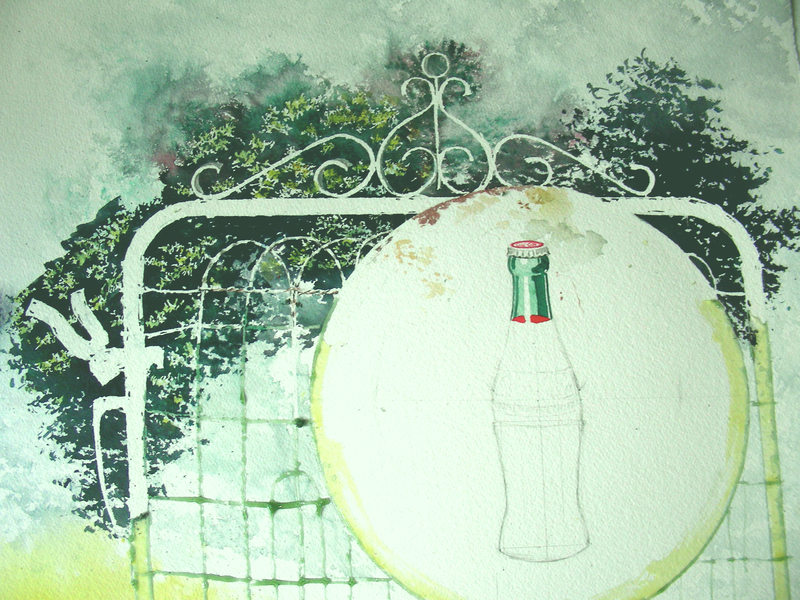 I also did a tiny bit of work on the Coca-Cola bottle cap, and some staining of the damaged sign. The light outside has gone away for the night, so I’m finished for now. But I cannot wait to wake up to this again tomorrow. Today has been splendid, with painting, reading, journaling, and guitar playing marking the time, all of it exquisite. I actually feel that my breathing has slowed down somewhat. And school doesn’t resume until Monday! Thanks always for reading. It’s nice to be back in this mode again. As a Texas watercolorist, I can hardly convey my delight in this small Texas town where Larry McMurtry’s Last Picture Show was filmed. This abandoned service station languishes around the corner, about two blocks from that historic cinematic location. To complete this composition, I had to go to my archives to find a vintage automobile I photographed in New Mexico years ago. Now, I feel that I’ve managed to create a visual time warp for those of who like to remember earlier days, cruising small towns and looking for something, anything interesting to do. If I grow quiet enough, I can almost hear the sound of a bell cable, as the car drives over it, signaling the service station attendant inside to put down the shop towel and come out anto fuel the automobile. It’s been a few weeks since I visited Archer City when temperatures soared five degrees above the century mark. How amusing that I return to my photos to paint this composition on a day when Arlington, Texas breaks a record low temperature set in 1900. The record from that day was 79 degrees; it is now 72. I don’t usual file weather reports on my blog, but this is unusual, and it feels good. I started this composition Saturday while sitting in my booth at a craft festival, then returned to it this evening after summer school to wrap it up. It is a quick sketch, but I’m very pleased with it. It measures 10 x 8″ and I’m offering it for $100 with a 14 x 11″ white mat. Every art form conveys a message. When an artist is young and still learning, that message is usually about technique: see what I can do. Decorative art has a perfectly valid message, one of beauty. As we mature, in both our art and in our life, we learn to understand our passions and these then become the subject we express in our works. But at the same time, passion is not the only source of expression because thought can also come into play. So an artist’s expression evolves from the heart (passion), the brain (thought) or a combination of the two (with usually an emphasis on one or the other). 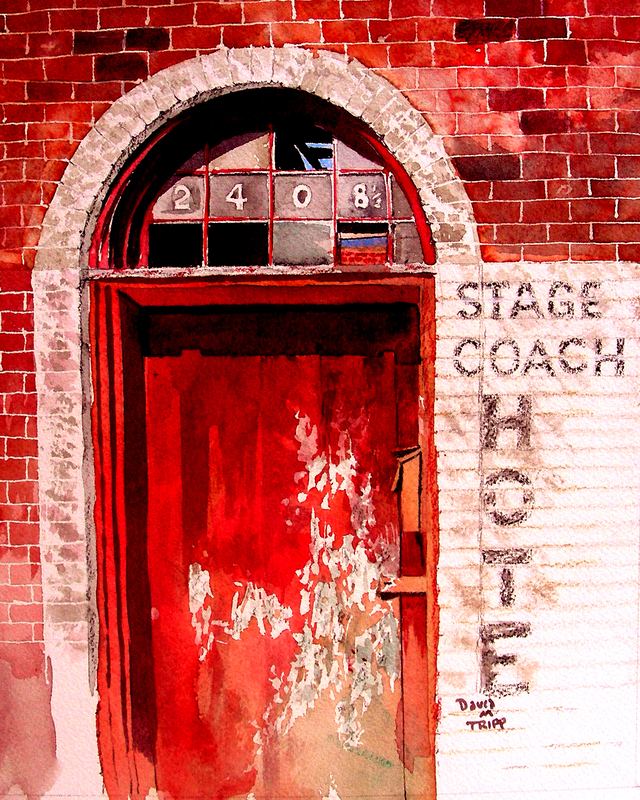 I am posting my second attempt at watercolor sketching the Stage Coach Hotel in the Fort Worth Stockyard District. When I photographed this portal a couple of weeks ago in late afternoon, the temperatures had already reached triple digits. My eye was “held” at the richness of reds in the sun-damaged door, and the smoky, grimy window panes that survived above. I couldn’t stop looking at these details, and took quite a number of photographs of the subject. I knew I wanted to take this one back to the studio and see if I could make something of it. Following the thread from the Alex Powers interview, I am finally settling down to watercoloring my passion after years of adding techniques and tricks to my toolbox. Reading Robert Henri’s The Art Spirit finally got my attention about that–it is time to let techniques support my objective in painting rather than building “interesting” paintings on a myriad of techniques. The immediate result is that my paintings are coming along even faster now, and I’m spending less time combing through my toolbox for gimmicks to toss out onto the painting. Portals have fascinated me for decades, but it wasn’t until this past winter that I took my first crack at painting close-up studies of door knobs. I next turned my attention to the surfaces of weathered old doors. 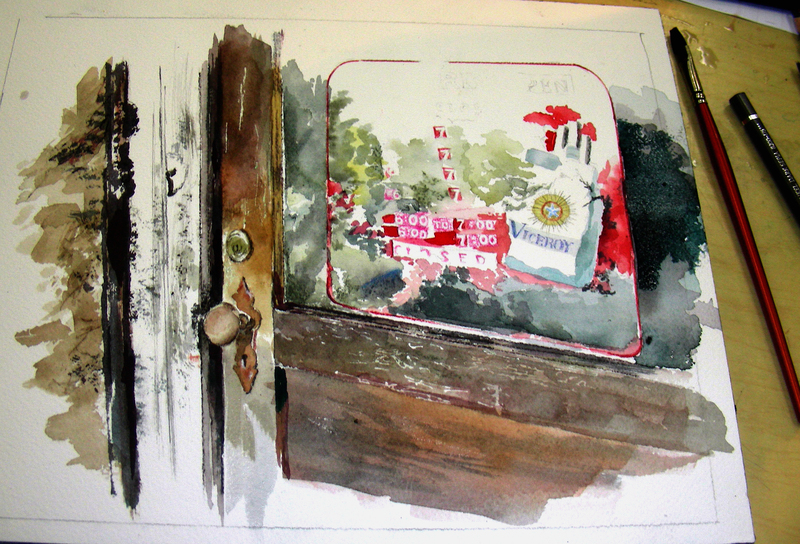 When the spring came around, I began experimenting with screen door compositions. All of these studies took place in my studio. For the past few weeks I have been traveling about, painting portals on site and enjoying the speed and decision-making of plein air painting. Now that Texas has settled into its inferno summer temperatures, I am perusing photographs that I’ve taken of these portals and making plans for additional compositions. All of this has been fulfilling for me. I don’t know how to explain my passion for the subjects I paint. I suppose I could just toss out the adage: for those who don’t understand, no explanation is possible; for those who do, none is necessary. I have probably mentioned in earlier blogs that I play guitar. I have not been able to accomplish with music what I have with the visual arts. I suppose that would fall somewhere under the “10,000- Hour” rule of Malcolm Gladwell in Outliers. I have easily put in my 10,000 hours of study and application in the visual arts. On guitar, well that’s another story. But my point in opening with the quote from Alex Powers is this: younger, less experienced artists can easily get caught up in the fascination of learning many, many techniques and tricks that “wow” the observer, just as many younger, less experienced guitar players load up their toolboxes with tricks and gimmicks to stun listeners with their performance. And yet, many young and less experienced artists still do not know how to build a painting, just as many guitar players in the same class cannot play a single song all the way through. And when they do (painters and guitar players), they often show creative flourishes, but not a finished masterpiece. I don’t say this with the sadness that I used to: when I play guitar, I am conscious that I can play all the notes correctly and sometimes even keep my timing consistent. But the “soul” is not there. My guitar does not gently weep. My listeners do not feel what I feel, because it is not coming through my fingers, not emerging from my guitar. I have witnessed scores of guitar gods playing my instrument, and I would swear that it was not the same instrument. I marveled at how they coaxed that sound, that soul, from my acoustic box. At this point, I still cannot. I used to complain this way about my paintings–that they were fine illustrations, ably constructed, correctly rendered, and so on. But now, I want feelings and moods to emerge from my pictures, not gimmicks. I want viewers to see my work, and feel what I felt in constructing it. And, to borrow a line from Hemingway: “I’m not there, but I feel I’m getting closer.” I am more excited about painting now than I ever recall feeling before. Because I know what I want. I know what I seek. The passion is there. And I’m starting to believe that the passion can emerge from my brush. Who knows? Maybe some day passion will rise from my guitar strings as well. But, one thing at a time. Thanks for reading. Sorry if this was too much navel-gazing. It’s been on my mind awhile now. Summer School is in its final minutes. I’ve taken out this watercolor sketch begun last evening, and am surveying what I did to it during intermittent breaks in this morning’s schedule. I’m enjoying it more, and feel that some of it is starting to take shape. I still have some complicated compositional matters to resolve, and still am “out of my element,” unsure that I’ll be able to pull that off. Nevertheless, I’ve learned a great deal about texturing, thanks to the door jambs. 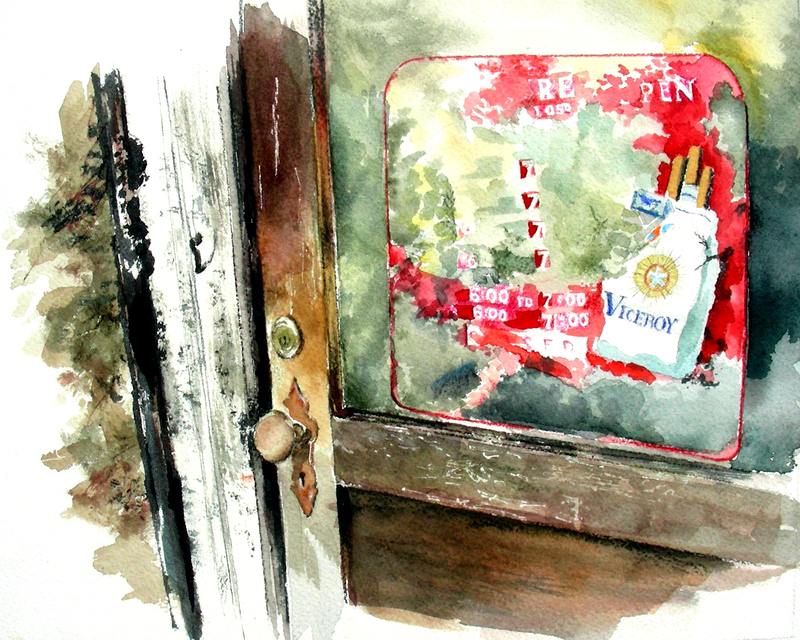 I’ve also been mesmerized by the gradations of color across the window of this door, and the fragmented cigarette poster afixed to it. That is where I’m finding the devil and his details, and I must say I’m having a good time of it. 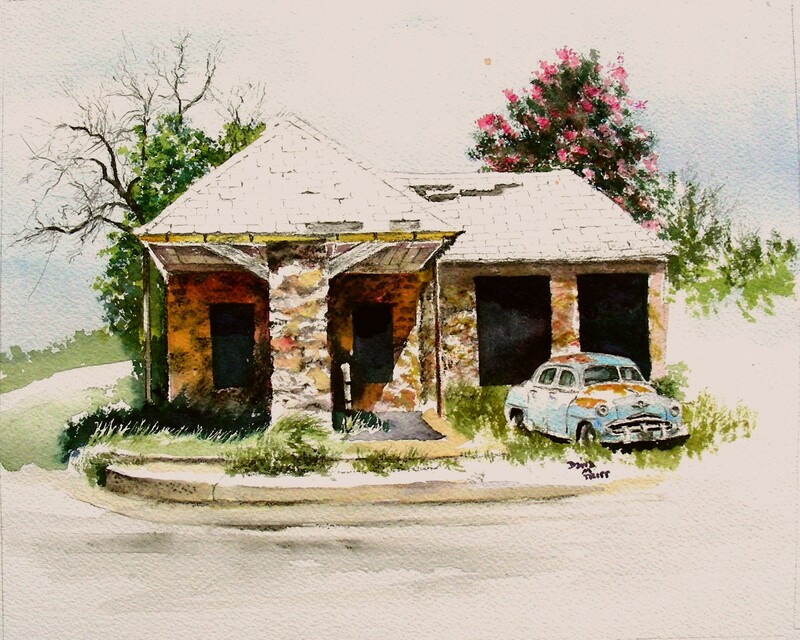 From the moment I laid eyes on this door of an abandoned service station in Archer City, Texas, I knew I was going to give it a try as a watercolor sketch. I fell in love with the remains of the Viceroy cigarette poster and schedule of hours still clinging to the filthy window. I’m amazed that the door still has its knob, lock, and even hook latch still intact. It was over 100 degrees when I took a series of photographs of it last weekend, but I have looked at these photos every day since then, and this evening decided to give it a try. This is one of my rare occasions where, from the start, I really have no clue as to what I am doing. I am indeed lost and giddy, staring at the residue of the cigarette poster, and have spent most of this evening trying to capture it on paper. The abused wood of the door I’m not as afraid of, and will start to refine later. But for now, I’m going to see if I can nail this sign and all the smoggy reflections and dust on the grimy window.